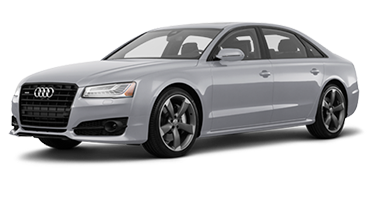 The new Audi A6 and S6 are the luxury sedans that don’t skimp on comfort or performance. Wherever the road takes you, all eyes will be on you in the new Audi A6 or S6. These sporty, luxury sedans are true head turners with their chiseled bodies, muscular stances, and bold Singleframe® grilles. 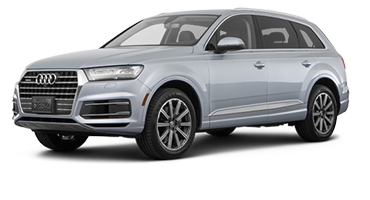 On the grille, you’ll find Audi’s iconic four-interlocking circles announcing your arrival. Sophisticated styling continues inside where you’ll discover an elegantly designed interior. Sit back and take in the sculpted dashboard with available inlays while luxuriating in heated sports seats. Four-zone climate control and ambient LED lighting package allows you to set the mood so you ride in comfort all the way to Irondequoit, Webster, or even Fairport. Peek under the hood and discover what sets the A6 and S6 apart. 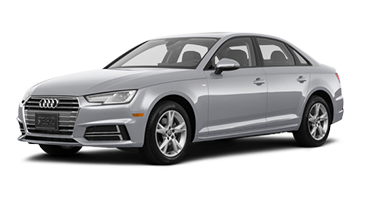 The Audi A6 offers an available 3.0-liter TFSI® V-6 engine that kicks out 340 horsepower, ensuring you have the power you want without sacrificing comfort. 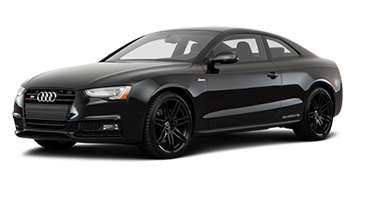 If you want to get your adrenaline pumping, opt for the Audi S6’s 4.0-liter TFSI® V-8 that sprints this luxury vehicle to 60 mph in only 4.4 seconds. All this and more is waiting for you in the new Audi A6 and S6. 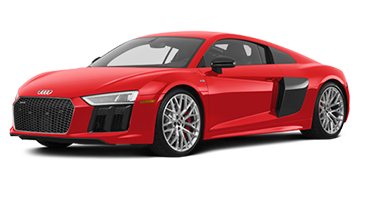 Schedule your test drive today with Audi Rochester. 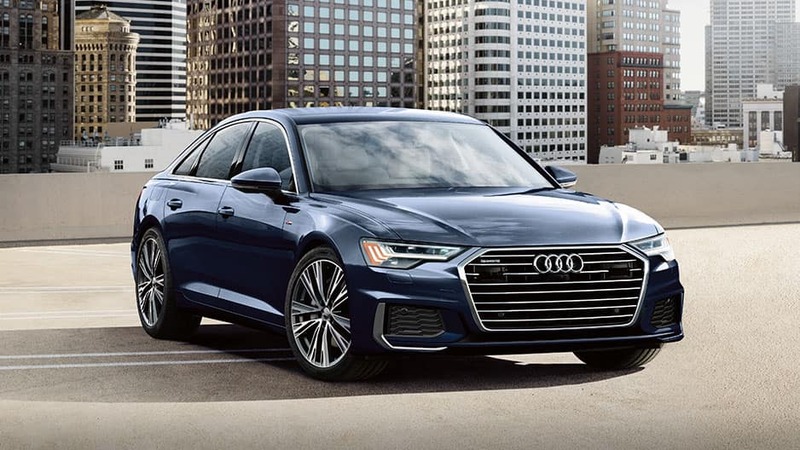 Whether you’re commuting to work or driving around town, the new Audi S6 and A6 have the head-turning good looks to ensure all eyes remain on you. 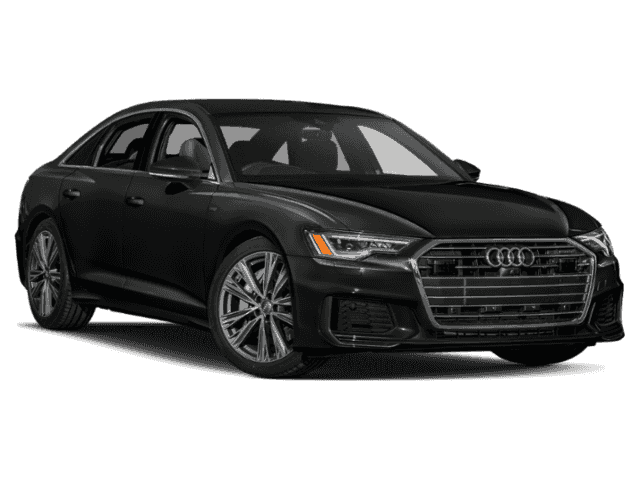 These luxury sedans feature available LED headlights, sculpted bodies, and a bold Singleframe® grille with Audi’s iconic logo in the front that guarantees you’re the center of attention. Audi designed the new A6 and S6 to leave a lasting impression with their sculpted bodies, athletic stances, and sleek lines. 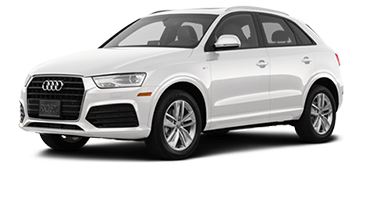 Announcing your arrival is the Singleframe grille on the front, emblazoned with Audi’s iconic four-interlocking circles. Even at a standstill, the new Audi A6 and S6 are breathtaking. Take your curb appeal to the next level with one of the available wheel designs, like the A6’s 20-inch five-arm star design or the S6’s 20-inch five-double-spoke matte-titanium wheels. Illuminate the road ahead with available LED headlights that cast bright light farther than traditional halogen bulbs. The rear boasts LED taillights with dynamic turn signals, ensuring vehicles traveling behind you see where you’re headed. The new Audi A6 and S6 are available in a wide range of colors with shades such as Matador Red, Sepang Blue, and Brilliant Black. Don’t see the exact color you want? No problem. Audi offers custom paint options that ensure this luxury sedan matches your unique personality. Give vehicles traveling behind you something fun to look at with the Audi A6’s dual-exhaust outlets and Audi S6’s quad-outlet exhaust. Not only do they improve performance, they enhance the overall sportiness of these luxury sedans too. Audi wanted to ensure you enjoy the ride. That’s why Audi designed the A6 and S6’s cabins with comfort in mind, featuring stylish sports seats, four-zone climate control, and an ambient LED lighting package that takes your comfort to the next level. Audi doesn’t do boring interiors and the A6 and S6 are no exception. Slip behind the three-spoke steering wheel and take in the carefully crafted cabin featuring premium leather, available inlays, and a sculpted, wraparound dashboard. Kick your comfort up a notch on chilly mornings with the Audi A6 and S6’s heated front seats. Press a button to warm the cushion and seatback to be wrapped in warmth and comfort. The Audi A6 and S6 allow you, your front passenger, and the rear passengers to choose individual settings for each area of the vehicle with four-zone automatic climate control, ending arguments over the interior temperature once and for all. Brighten up your drive with the Audi S6 and A6’s power sunroof. Press a button to slide the glass back and allow fresh air to enter the cabin. Opt for the available ambient LED lighting plus package and up the Audi A6 and S6’s comfort levels. This package provides LED lighting that illuminates the interior’s contours with up to 30 color choices. Never miss out on a thing in the new Audi A6 and S6. 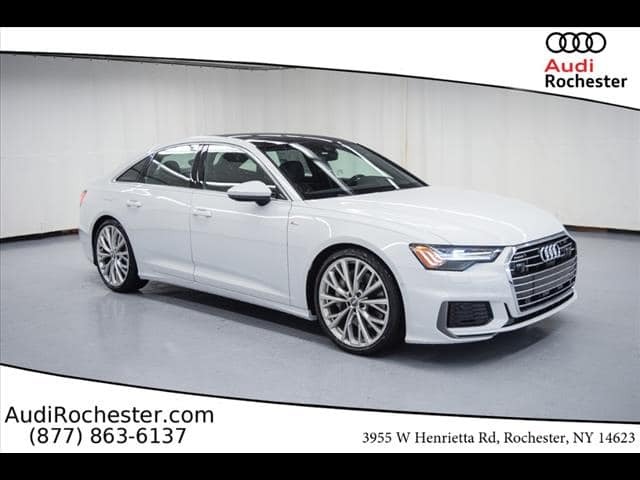 Audi designed these luxury sedans with the advanced technology features you want, including smartphone integration, 4G LTE Wi-Fi®, and Bose® Surround Sound System. The Audi A6 and S6 make it easy to stay connected on the go with smartphone integration via Apple CarPlay™ and Android Auto­™. Sync your mobile device and access audio streaming, navigation, and hands-free calling from the touchscreen. Using handwriting-recognition technology, MMI touch allows you to “write” your entries on the touch pad. This allows you to choose your music or input directions without touching the display screen. Pump up the volume and surround yourself in crystal-clear audio with the available Bose Surround Sound System. This innovative system features 14 speakers, 630 watts of power, and AudioPilot® noise compensation to ensure you enjoy the drive. Stay in the loop with 4G LTE Wi-Fi via Audi connect®. This system not only keeps your smartphone connected, it also provides information from Google Earth™, weather, and traffic right on the touchscreen. Keep important information front and center with the Audi A6 and S6’s available head-up display. This system projects information such as the car’s speed and navigation onto the windshield in front of you. 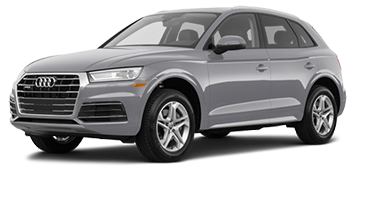 Audi wanted you to have peace of mind no matter where the road takes you. That’s why the new Audi A6 and S6 offer the latest in advanced safety features, including the top-view camera, Audi side assist, and adaptive cruise control. Don’t be caught by surprise in the Audi A6 and S6 with the available top-view camera. This feature paints a 360-degree top-view imagine of the vehicle and objects around you so you remain aware of your surroundings. With this available feature, you can set a following distance and a cruising speed. If the system detects you’re approaching a slower vehicle, it will slow the A6 and S6 down to maintain that distance. When the system no longer detects the vehicle, it will accelerate back to the original cruising speed. Available Active Lane Assist uses a camera mounted in the rearview mirror to detect lane markings. If the system detects unintentional lane drift, it alerts you with gentle steering wheel vibrations and steering guidance to get you back on track. 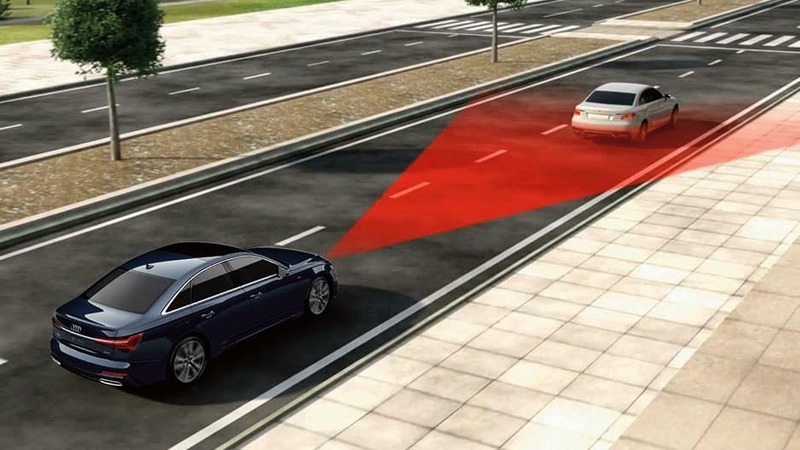 This available system uses radar technology to monitor the A6 and S6’s blind spots. When a vehicle enters one of these blind zones, the system will alert you with an illuminated icon on the corresponding side-view mirror. Night Vision Assistant is available on the Audi S6 and helps you stay alert in low-light situations. If it detects pedestrians or large animals within 1,000 feet, it will alert you with a visual indication on the multi-information display screen. Take a peek under the hood, and the key differences between the Audi A6 and S6 become clear. Whether you prefer the smooth driving of the A6 or the adrenaline-pumping thrill of the S6, Audi has a vehicle that matches your driving style. The Audi A6 strikes the perfect balance between comfort and power. 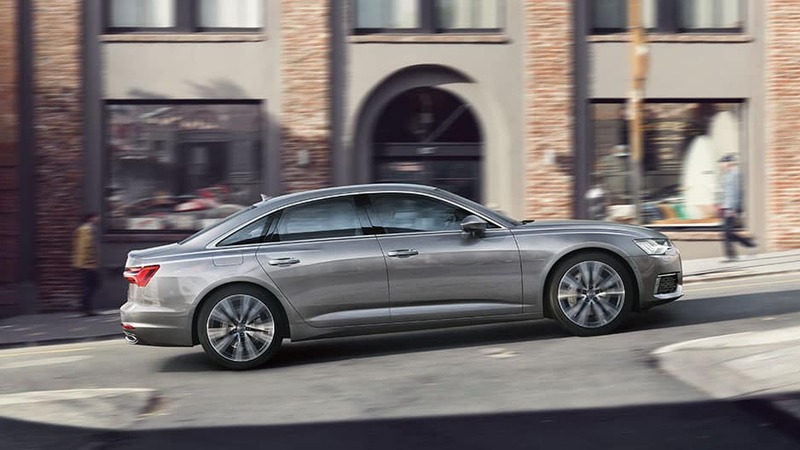 Its standard 2.0-liter turbocharged four-cylinder engine produces 252 horsepower and sprints the A6 to 60 mph in 6.7 seconds. 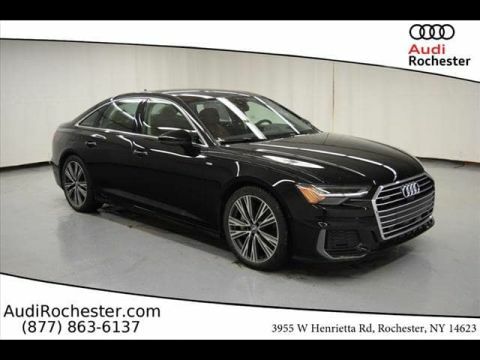 This luxury sedan offers an available supercharged 340 horsepower V-6 engine that takes you to 60 mph in 5.1 seconds without sacrificing your comfort. For the adrenaline junkies, there’s the Audi S6’s powerful 4.0-liter TFSI® V-8 engine. This beast boasts up 450 horsepower and 406 pound-feet of torque, racing this luxury vehicle to 60 mph in a thrilling 4.4 seconds. Tackle any road conditions with quattro all-wheel drive that’s available on the Audi A6 and standard on the S6. This system distributes power evenly between all four wheels, ensuring a tight grip on the road, even in inclement weather. Audi pairs the A6 and S6 with a standard seven-speed S tronic® dual-clutch transmission, ensuring smooth, easy shifting for the most comfortable ride. 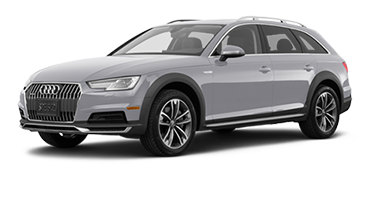 With its optional quattro all-wheel drive, the A6 gets an eight-speed automatic transmission. Audi drive select allows you to adjust the A6 and S6’s performance to how you want to drive. Choose from four modes — Comfort, Auto, Dynamic, and Individual — and the system will fine-tune performance to match. Sit back and enjoy the ride in the new Audi A6 and S6. 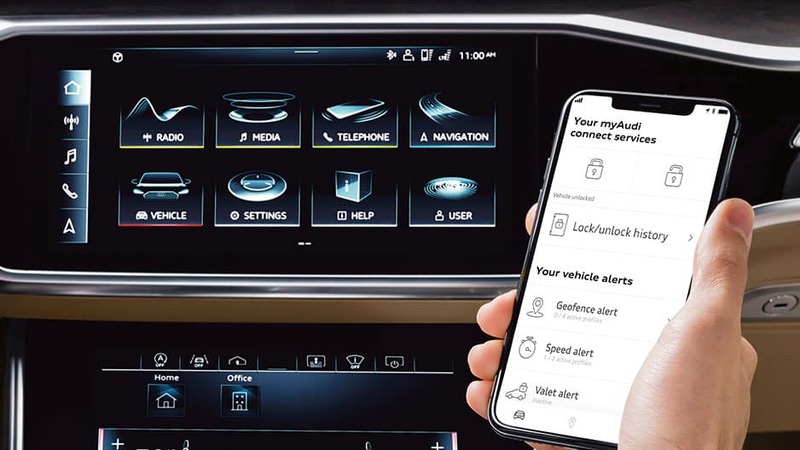 Audi designed these luxury sedans with the journey in mind, guaranteeing you never miss out on a thing with the MMI® infotainment system and 4G LTE Wi-Fi® via Audi connect®. Sync your smartphone, pump up the volume, and say “goodbye” to boring road trips. Audi wanted to ensure you had peace of mind on every drive. 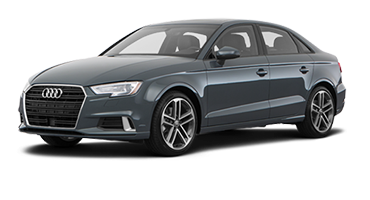 That’s why the A6 and S6 feature the latest in advanced safety technology. With systems like adaptive cruise control and Audi side assist, it’s no wonder the A6 and S6 were awarded 5-Star Overall Safety Ratings from the National Highway Traffic Safety Association. Let nothing stop you from your next adventure. 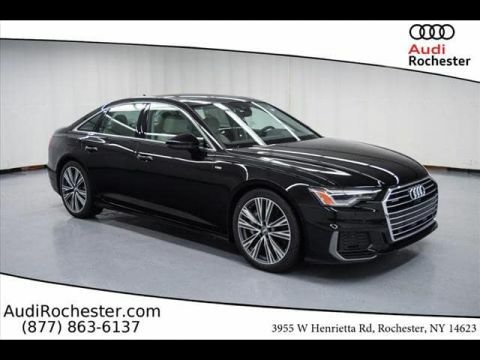 Discover whether you prefer the comfortable driving of the Audi A6 or the thrilling performance of the Audi S6 first-hand, by test driving both at Audi Rochester today. 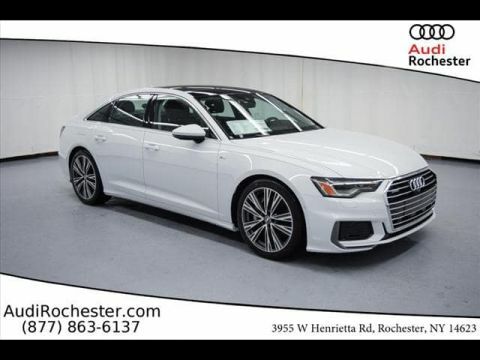 *MSRP: Starting MSRP of $58,900 for a 2019 Audi A6 Premium with automatic transmission. Model shown is a European model with available equipment. Prices exclude $995 destination, taxes, title, other options and dealer charges. Dealer sets actual price. 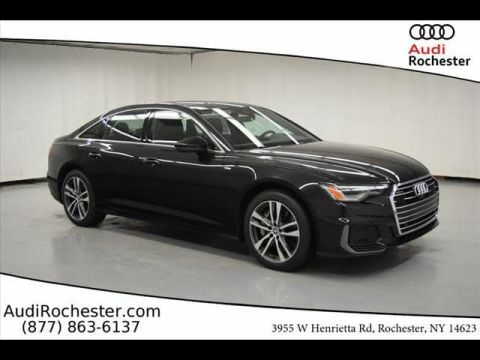 MSRP is for the 2019 Audi A6. *Fuel Efficiency: 22 city/29 highway mpg. EPA estimates. Your mileage will vary and depends on several factors including your driving habits and vehicle condition. MPG is for the 2019 Audi A6.